I have just completed reading this book for the second time and it has been even better then the first time.I'd already seen the BBC series before reading the first time so I already knew the story, and I wish I'd come to the books afresh in a way though I do not think that would have altered in anyway, the way I perceived them. Though Richard Armitage certainly does help and I swooned over Thornton even more.What I love about North and South is the passion and the realness of the characters, the emotion between the characters. I loved the passion of Thornton, his feelings and emotion so strong and real they almost popped off the page.The characters aren't characters but people, and they feel real and honest, not caricatures of people or flat emotionless representations. North and South is Pride and Prejudice meets Industrial Revolution in the North of England. Only, Mr Darcy is more of a Margaret in that she snobs Mr Thornton in the beginning. Like Lizzie though, Margaret is a strong woman - and more fiercely independent.Both of these books would make an interesting comparison. Both books are set in rather different times. North and South in a time when women could own property and so could be more independent. The industrial revolution was in full fledge with the rising middle class during a great time of progress. The railway made it easier for people of all classes to move about.North and South is a love story that takes place on the background of two conflicts - the class conflict between the North and the South, and the conflict between the mill owners and the trade unions. Mr Thornton is a tradesman from Milton (really Manchester) and Margaret is the daughter of a parson from the New Forest. She has grown up for most of her latter path of childhood in Harley Street, London. When Margaret's father decides to leave his job as parson of Helstone in the New Forest over a crisis of conscience he takes his family to Milton to start a new life as a tutor. One of his favourite pupils is the mill owner, Mr Thornton who is brusque and does not have the manners of the south. There was a great snobbery about tradesmen - even though money-wise Thornton was richer then the Hales - he was still a tradesman rather then a perceived gentleman. And through misunderstandings of each others manners and ways, Margaret and Mr Thornton often find themselves at opposing sides of the argument. Meanwhile, she also befriends Nicholas Higgins, a passionate mill worker who is behind the trade union strikes.I much prefer North and South to Pride and Prejudice, though both are so different from each other in many ways. Gaskell is a bit more worldly, having been married, lived in the North and having a wider circle of friends. Her father was also a dissenter who left the church on grounds of consciousness, a theme I have noticed popping up in her other stories. (My Lady Ludlow springs to mind.) So North and South has a much more wider perspective.I think in the end though, what makes a novel good, what makes a good author - is their ability to create characters that feel so real you can almost tough them. If the characters are flat, then so will the rest of the story even with a brilliant plot - it is the characters that make a story.Margaret Hale and John Thornton are two people that live on in my imagination. "Pride and Prejudice" wouldn't have been a bad title for this comparative study of English society in the midst of the Industrial Revolution. I must say that I was prejudiced against it before starting, and have to swallow my pride and admit I was wrong!I thought it would be a dry copy cat version of Hard Times, as the circumstances of its publication seemed to suggest that. But never trust your prejudices - that is what I learned from reading this highly entertaining and original story, and it also constitutes the enduring message of the unfolding plot.A clash of cultures in miniature, between the traditional life style and manners of the South, and the raw, harsh, booming manufacturer ways of the North, it offers plenty of opportunities to play on different layers of pride and prejudice. The charm lies in the fact that each social group has its own code of honour, and feels contempt towards all other groups within English society. Margaret Hale and her parents, representing the South, despise the rough and straightforward behaviour of the rich and thrifty manufacturing people, and consider their education lacking and their company uninspiring.The North, on the other hand, represented by Mr Thornton and his family, sees the South as lethargic, sponging, and useless, and admires its own masculine strength, wealth and action.Both privileged classes, Northern and Southern alike, despise simple workers and their ideas, as well as servants and women in general. That is also reciprocal, and Elizabeth Gaskell brilliantly shows the arrogance and pride of workers, whose contempt for the manufacturers is just as strong as vice versa. Higgins, a passionate Unionist, takes pride in the organisation of a strike in exactly the same way that Thornton celebrates his ability to solve the issue to his own advantage.Pride and prejudice - all over the place. The slowly developing love story is threatened by the same problem. Rather than speaking openly to each other, both Thornton and Margaret choose to make up their own (prejudiced) minds on the behaviour of the (unconsciously loved) antagonist, and to proudly refuse any clarification of ensuing misunderstandings- until the very end.It sounds quite bleak, and the novel certainly does not paint mid-19th century life in idealistic colours, but Gaskell offers a solution to the social paralysis - on an individual level.What breaks the barrier of prejudice? Knowledge! As soon as Margaret understands the life of the people in the mill town Milton, she learns to respect it. When Thornton and Unionist Higgins get to know each other, and spend time together, prejudice changes into mutual respect, based on true understanding of the other person's perspective. Knowledge and communication are the best weapons against prejudice - in the novel, and in real life.And what destroys pride? Love. As soon as the characters realise they will lose what or whom they love, they are willing to overcome their pride and take a step outside their comfort zone. What Higgins refuses to do out of principle, he does out of love and compassion. And the same applies to Thornton and Margaret.It is possible to argue that Gaskell doesn't find a general solution for the clash of interests during the Industrial Revolution, and that she relies on strong personalities to step outside their social boundaries and reach out rather than on creating a social idea that works independently. That was my first thought. But then I reconsidered, and thought that it is precisely individual enthusiasm and willingness to make a change that puts social development in motion. No idea, and no theory are worth anything without people with an open heart, who see humanity in people who are entirely different from their usual environment and social training.True open mindedness starts with understanding the "other side" and with being curious to learn more about new perspectives. Individual effort pays off - in the long run. That is a stimulating and positive message! I can't quite put my finger on why I love this book quite as much as I do. And even for someone who does re-read books as much as I do, to get through 3 copies of one book is quite a feat. For me, the most remarkable achievement of Gaskell is that she is able to combine so many elements of various 19th century novelistic traditions and yet not have the novel collapse into incomprehensibility.The broad scope of the novel, coupled with insightful depth and comment means that each reading of the book can offer something new. Read it as a straight forward (or not) love story, a fictional romantic biography. Then discover the class politics that run through the novel. Or perhaps the debate (as the title suggests) between the rapidly industrialising north and the more gentrified south. Or the sexual and gender politics that create a constant thematic pulse throughout the book... Or any other matter you choose to seek out from religion to the nature of authority and so on and so forth. There is so much to be gained from the many directions in which this book can pull you: I personally have often come away from the book wanting to follow up on points raised, to examine the history behind the work. Or, if in a romantic mood, I will find snippets of prose or dialogue floating around my head.I imagine for the majority of readers their primary concern is the love/hate relationship between Margaret and Thornton. Their story is successful because they are believable: they are imperfect, act willfully and foolishly, but ultimately they are good people. Margaret, especially, is an engaging heroine: her independance and strength of character in the face of (remorseless) adversity make her compelling, and gives the reader a real desire to see her gain her "happy" ending. Criticisms I have heard against the book have numbered the following:-It is dry-Its "over-emotional" prose kills any actual emotion (i.e: it is poorly written)-It is unbelievable-Gaskell mimics other author's stylesBut I believe most criticisms can be easily refuted. Obviously, to enjoy this book you need to familiarise and accept the conventions of the 19th century novel (i.e: long, expository, sentimental, sensational) and soak up the atmosphere and melodrama as part of the essential charm of the novel. After all, that's how the escapism occurs! North and South is no more dry (and in my personal opinion a lot less dry) than Dickens, far less emotional than the heated Villette, and certainly as believable as anything written by Austen, Shelley or the Brontes. Indeed, Gaskell is more firmly tied to realism via her evocation of working class Manchester. And in terms of Gaskell owing much in style to, say Dickens, that is no great suprise: Gaskell was similarly writing in serialised format, and Dickens edited much of North and South. But owing a stylistic debt to another artist is not an indicator of lack of artistic merit: otherwise we would have to discount the majority of Shakespeare's work.Essentially then, this is a book that continues to keep giving and at the very least will provide a very pleasant few hours of escapism into another (marvellously pictured) world. I read this because I'd seen the BBC production, and wondered if Margaret Hale would be less silly in the book. North and South sounds like it should be about social and geographic divisions, but it's actually about finding balance amidst constant change. Although I found her character annoyingly reactive, the Miss Hale of the novel is decidedly less silly than she of the movie.I've read comparisons of Mr. Thornton to Jane Austen's Mr. Darcy, but I don't personally see much likeness--aside from a tendency to scowl. I actually preferred the BBC's Mr. Thornton, as he talked less and scowled more than Mr. Thornton in the book. Plus, he was played by Richard Armitage, which is never a bad thing.My favorite characters are Mrs. Thornton (Mr. Thornton's strict, severe mother), and Mr. Bell (Miss Hale's rich godfather). Mrs. Thornton has more sense and self-control than all the other characters in the book combined, and Mr. Bell is the only person with a sense of humor.Regardless of Miss Hale's silliness, I really enjoyed North and South. Miss Hale bounces back admirably from all the deaths and strife that the author inflicts on her. I would have appreciated more of Mr. Bell's levity, and a tad less angst from Mr. Thornton, but I was completely immersed in Miss Hale's world and find myself missing it now that I've finished the book. of delicious silence". It doesn’t take much imagination to work out what was happening during that “delicious silence”. A private kiss in a drawing room may not be quite as romantic as a public one on a railway platform, but it’s not too shabby either. (hide spoiler)]There are times when my reader’s soul craves lean, hard prose, stripped of excess adjectives and adverbs, where the action happens quickly and description is kept to a minimum. There are times when I am happy to wallow in lovely long words, with an abundance of description. This is a book for those times. It lacks the sparkle and wit of an Austen novel. Its language does not have the poetry of Hardy’s descriptions of landscape. But it’s a wonderful experience for a patient reader who wants to travel to a different time and place and is in the mood for an interesting tale, well told. North and South is the only Gaskell I have read so far. I first read this after watching the BBC TV series (a thing I really should not have done) and the overall impression I got was that this was a love story. However I liked the book very much and this prompted my reread this year. But on the second read, I'm surprised to find this to be otherwise. I mean, there is still a love story but that is not all. It is also about the clash of southern and northern ideas and the clash of working class people and their masters.Margaret Hale, full of southern pride, finds herself suddenly placed in a northern industrial city. Having entertained a strong prejudice against the tradesmen, she views the northern mill owners to be similar uncouth men. Her pride and the misconceived notions mar her better judgement and she forms an instant dislike for Mr. Thornton. This dislike was mutual initially but Mr. Thornton goes through gradual change; and although he dislikes her haughty ways, he slowly learns to appreciate her for her true qualities. Margaret, though not as quickly as Mr. Thornton, too goes through this gradual change and learns to appreciate who he truly is. Gaskell's idea of bringing these two characters, as I see, is twofold. First, through these characters, one from south and other from north, she shows us how the different views, beliefs and misconceptions of the two ends were reconciled. The southerners saw the industrial northern cities as noisy, smoky and full of uncouth people while the northerners saw the south as full of idle people who lacked action and also depth. It was interesting to see how Gaskell expressed these clashing views of both ends through her main characters, and the final reconciliation of the two was more as a reconciliation of North and South where both sides come to understand and respect each different ways. Second is, of course, the obvious reason of filling a love story. Although Gaskell succeeded brilliantly in the former, I felt she failed quite a bit in the latter. The romance was, for the most part of the book, was one sided. Mr. Thornton loved Margaret regardless of her rejection and also regardless of her disdain towards him. Margaret slowly discovers who he actually is and learns to respect his qualities and eventually falls in love. But while Gaskell expresses very fluently the feelings of Mr. Thornton, that eloquence was not employed in the case of Margaret; and so when Margaret did fall in love finally, I felt it was rather forced. (Maybe it is my fault for having watched the BBC series before reading).On to the theme of "master" and "hand" (workmen) relationship, Gaskell stresses the importance of creating an amenable setting between the two classes to achieve greater productivity. Higgins and Thornton have been used for this end, and it was really interesting to read the clash of these two classes through the two strong characters.Overall, it was an interesting reread and I think I enjoyed it more this time. Caution: Spoilers and Snark abound!I’m afraid this review will not be popular with fans of the author, or those who see classic literature as unassailable. But after slogging through this book (especially so soon after discovering Villette, a truly excellent classic! ), I feel obliged to warn potential readers, and let those who were disappointed with the book but wary about criticizing a classic know that they aren’t alone.So, then: a recipe for North and South:-	Add one romantic plotline borrowed straight from Pride and Prejudice, only the leads’ arguments are about labor relations. Also, after the disastrous proposal scene, don't let him write a letter and so keep the relationship on hold until the last two pages. (These reviews lay out many more similarities between the two books that I have not repeated here. )-	Add some poor families/dying children borrowed straight from Dickens, only keep the deaths off-page.-	Add at least 6 character deaths, almost all off-page. The deaths and subsequent grieving can substitute for a plot throughout the second half of the book.-	Add 1 Mary Sue, otherwise known as Margaret Hale. Everybody must worship Margaret. Include sentences such as “Martha, like all who came in contact with Margaret.... felt it a pleasure and an honour to forward any of her wishes.” Ensure that even Lady Catherine.... sorry, Mrs. Thornton.... is melted by her lovely eyes and straightforward demeanor. Have characters berate each other for not singing her praises enthusiastically enough, then report the incident to Margaret with concern. (I am not making this up!) Also, describe her constantly. Like when she meets the leading man for the first time. Don’t describe him, describe her! Again!-	Add many interior monologues by the leading man detailing his feelings for Margaret. Think you have enough? Try doubling that. We want to know EXACTLY how in love with her he is.-	Add a handful of goofy, melodramatic scenes and startling coincidences. (I shudder when I think of that riot scene....) While these may threaten any feelings of authenticity the plot may have had, at least they'll keep it moving when you run out of deaths.-	Add 4 cups of tedium. Mix well.-	If you are Penguin Classics: sprinkle useless, spoiler-laden endnotes (such as, after Margaret shares her views of a subject in Chapter 1, “Margaret painfully revises her view of X after the deaths of A and B”) throughout. This is super easy to do because all you have to do is find really obvious points in the text and spell them out.Voila! North and South.In all fairness, and the reason I at least give 2 stars: there is some decent characterization here, particularly of the minor characters. There are some passages that make me think the author might have turned this into a decent social satire a la Jane Austen. And I’m willing to admit that the book might have been ahead of its time on some issues, like workers’ rights, although the bookjacket gave the impression there would be more of a social justice ethos, when it seemed to me just repackaged Dickens (who was its publisher) plus a strike. But was it ever a slog to get through! There just was not much tension in this book; even the romance wasn’t interesting until the last two pages, and by then it was too late.So: apologies to any who loved this book and were offended by my irreverent treatment, etc. As for me, I’ll just read more Jane Austen. Or better yet, Charlotte Brontë. I'll admit that until about a month ago, I had never heard of Elizabeth Gaskell. I stumbled on her work after watching the BBC's miniseries North & South, which I loved. (All of you Pride & Prejudice fans out there should check out North & South. It's wonderful. )Anyway, I read up on Gaskell and found that she's a hidden gem of 19th century British literature. Her books have romance, but also strong social themes. North & South focuses on the factories and industrial workers in northern England in the 1850s.Its heroine is Margaret Hale, the daughter of a poor clergyman. She manages to make friends among the mill workers and sympathizes when they strike for higher wages. Gaskell takes the opportunity to write the dialect of the workers, which is in sharp contrast to the educated Hales.Meanwhile, one of the factory owners, John Thornton, falls in love with Margaret, but she despises and misunderstands him. It takes about 400 pages (or four hours, in BBC time) for the pair to sort things out.And what a delightful 400 pages it is. I usually really enjoy books of this genre but this one left me unmoved. I liked the characters who were all beautifully drawn and well rounded. Mrs Hale has to take the prize for selfishness although several others came very close. I enjoyed the story very much but felt that the author rambled a bit too far and also enjoyed her soap box a little too much. These were all important issues of the time but were delivered with a very heavy hand.The relationship between Mr Thornton and Margaret was done well until it became much too drawn out and then was suddenly dealt with in one last paragraph. I felt a bit short changed there!So basically, for me, it was okay but not as good as I had hoped. Gaskell is at her best with the tiny details of life that make the characters and the setting come into sharp focus: Margaret sitting on the worn carpet before the fire, the candles unlit until her parents appear. The observation about how two people, left alone in an enormous room, will speak in low voices as if "unwilling to awaken the unused echoes. "Gaskell's side characters, especially the women, are delightfully rounded, even if her hero and heroine are a tad too uprightly conventional: Mrs. Thornton's conflicted character shows signs of the beautiful characterizations to come in Wives and Daughters. Ditto Fanny Thornton and Edith, Mr. Bell, and Mr. Higgins.On the downside, in this her second novel she is still using standard Victorian tropes--Margaret (who is supposed to be strong and vital) fainting every time she is shocked or surprised, lingering sentimental deathbeds, wise suffering children (Bessie is very hard to take), sudden deaths as plot conveniences. It can be said that sudden death was a part of life at that time, but there are a lot of them here, and Mr. Bell's convenient appearance at the end (rather than when he should have come, before the Hales had to go to Milton in the first place) and his equally convenient death diminishes the dramatic impact even as it gives the requisite happy ending. Then there is the unconvincing Frederick/Leonards thread, as if Gaskell shrank from violent detail, whereas a scene I think was meant to be funny about boiling a cat to death is shocking and horrid--reminding us of very different attitudes of the time.I believe we are supposed to like John Thornton more when he (in another Victorian trope) discovers third-hand (because maidenly delicacy forbids Margaret to actually communicate with him) that the man Margaret was seen walking with at the railway station was her brother, and he is relieved that she was never guilty of "unmaidenly" behavior. Though that is a real eye-roller now, I think what Gaskell was groping for was Thornton being a good guy because he respected women. Clue: he is very good to his mother. Unfortunately, there is that underlying judgment about only "good" women deserving respect.But this is a step along a very steep, stony trail. And Gaskell did slowly divest herself of Victorian tropes in favor if subtlety and complexity in her characters, as she wrote more.One more observation, something I've noticed in Gaskell and Elliott and several other Victorian writers of that period, how they go on and on about women's throats. Is this supposed to be covert sexiness? The arched and swan-like columned throats are peculiar but persistent through literature of this period. I should do a read to see if male writers use it as ubiquitously as female writers do. I shall always remember ‘North and South’ as one of the last books that my mother and I discovered together. She loved books all her life, and even when her short term memory and her ability to follow a story faded she still appreciated lovely prose, being told about the books I was reading, and watching costume dramas on television. She loved the BBC adaptation of ‘Cranford’, and was able to recall studying the book and school and talk about how what she watched and heard compared with what she had read decades earlier.When we talked about Mrs Gaskell and her work she said that she had never read ‘North and South’, and I recalled that it had been adapted for television too, and that that adaptation had been much praised and much loved. And so I ordered a book and a DVD so that my mother could watch and I could both watch and read.We were both smitten, but I couldn’t help feeling that I had rushed the book a little, to match the pace of the dramatization. And so I came back to the book, to read it again at a steadier pace.‘North and South’ has all of the attributes of a great novel.It has a wonderful cast of characters, richly and deeply drawn, utterly believable, and so very engaging.I was very taken with Margaret Hale, who coped so well when she returned from the London home where she had been raised and educated with her cousin Edith, after Edith’s marriage, to live again with her mother and father in his country parish. She was prepared for a life there but she was tipped into a very different life, because her father had a crisis of faith, gave up his parish, and moved his family from the south to the north, where he believed he would be able to support them by working as a tutor.It fell to Margaret to manage everything, as her mother was fragile, and her upbringing in a family much better placed than her husband’s left her ill prepared for the future she was facing. That Margaret understood her parents so well, that she loved them both so dearly, and that she was exactly he daughter she needed to be did her great credit. That she became involved with the lives and concerns of the mill workers of her new home town, in the same way that she might have been involved with the lives of her father’s poorer parishioners, did her yet more creditBut Margaret could be proud and haughty, she looked down on the mill owners, and she failed to see their side of any argument. In particular she looked down on John Thornton, who worked hard to support his mother and his sister, and who studied with her father; believing him to be arrogant and uncaring. He realised that she looked down on him, but he found much in Margaret to admire ….The story grows quite naturally out of these characters, their lives, their families and their times. There is poverty and there is industrial unrest in the industrial north. And the Hales have a son who is in exile as he is wanted – unjustly – for naval mutiny. His mother’s dearest wish was to see him again before she died ….Mrs Gaskell constructed her plot very cleverly, drawing in all of her character in the north and in the south. It is in a large part driven by familiar devices – a misunderstanding and an inheritance – but they are woven in so well, every thing that happens, every character, every relationship, every interaction, rings completely true.On my second journey through ‘North and South’ what struck me was the wonderful depth of everything: character, plot, time and place. The has things to say about people, families and communities that are timeless; and it speaks equally well about its period, about the consequences of industrialisation; about the social history of a particular time and place.You might say that it was the book with everything: class conflict, politics, religion, family, women’s rights, social responsibility, and maybe love ….I couldn’t doubt for a moment that Mrs Gaskell knew and cared deeply about everything in this particular story. I wondered if she had known a maid as strong and as devoted as Dixon; if she had known a matriarch as proud and as loyal as Mrs Thornton; if she knew a couple who were as different from each other and who loved each other as well and Mr and Mrs Hale.There’s a wealth of detail woven in – details of character, description, dialogue – and that really enriches the story.The moments of drama, the confontations, the dialogues, were particularly well handled. The pace was wonderfully controlled; almost, but not quite stately.I remembered much of the story, of course I remembered the final outcome, and yet the story held both my head and my heart from the first page to the last.And now I know that I love the book both for its own sake and for its associations. On Sunday evening I finished reading Elizabeth Gaskell's North and South. It's the book they based the wonderful BBC movie on, in case you were wondering. It took me three weeks, maybe four to read this novel. I think that's the longest time I've spent with a book this year (not including when I've reread some of my favorites). A couple of years back I remember starting this book, but for some reason or another I didn't finish it. Just recently I came upon a website that posted pictures from the movie with captions either from the movie, different actors/directors and captions from the book. In going through these pictures and quotes, episode by episode, I felt a great need to try and read this book again.This time, I was much more thorough. I kept a yellow marker with me whenever I read it so that I could highlight my favorite parts - which mostly included anything romantic or anything that peaked my interest.I gave it 5 stars. It really was excellently written in beautiful style. I think it was as enjoyable and satisfying as any Jane Austen book. I just loved the language and images that she described. She originally wrote it for a magazine/newspaper that Charles Dickens edited. It was written like a serial. There are 52 chapters, each of which are never more than 10 pages long. I loved it because whenever I had time to sit down and read it, I could always finish a chapter.Now, into the story itself. It struck me how everyone around Margaret used her. She is portrayed as a strong, independent, beautiful woman. But for all that, her goodness was always taken advantage. First with her father. He tells her about his decision to leave the church. It was very hard for him to tell her and very hard for her to hear. However, he doesn't feel like he can tell his wife, so he asks/makes Margaret do it. Later on, Margaret is required to keep the secret of her mother's illness. Not only that, but she's also required to tend to her as well. Then, her brother, inadvertently uses her to cover up their involvement in the death of Leonards. Over and over, these things happen. Even her cousin uses her as a nurse maid for her children. I was frustrated for her. She should not have been put in those situations, especially if she was as strong and independent as she is described.It's interesting note the passing of time in this book. Margaret spent two years in Milton, in which both of her parents died and her good friend Bessy Higgins. Then she leaves and moves back to London. She is there for a year, in which Mr. Bell dies and in the end she accepts Mr. Thornton's proposal. When I watched the movie I was not aware of this movement of time.I loved reading the thoughts of both Margaret and Mr. Thornton. At first they were attracted to each other. Then Margaret is disillusioned with him and really doesn't give him any thought until the strike. Mr. Thornton on the other hand, is captivated from the beginning. However, like Mr. Darcy, he failed in courting her and thus his proposal was refused. It is after this refusal that Margaret starts thinking more about him. Then, when she lies about her brother, she cannot stand the fact that Mr. Thornton knew she was lying, but did not have the courage to dissuade him of this. Whenever she thinks about him she suppresses investigating all of her feelings. After the refusal Mr. Thornton tries to prove to the world that he is not pining over Margaret. He even tries to put himself in her company, to prove his self mastery to himself. While all of the time loving her more and more, even though hope of marriage has died. Then in the end when they meet up again as equals in each other's eyes - it's just magnificent. It was wonderful!As for the rest of the novel, it was quite enjoyable. I was interested in the workings of not only the commerce in Milton vs. London, but also in the societal differences as well. The characters were well written and each provided their own poignancy to the story. All in all it was a delightful read. I know you despise me; allow me to say, it is because you don’t understand me.I absolutely adore this book! The only disappointment was the abrupt (albeit happy) ending. I wish there was a little bit more of a wrap-up of plot and characters at the end. And there were a few too many simultaneous deaths in the book so that the last couple hardly affected me at all. But otherwise, I really enjoyed it. The banter and dynamic between Mr. Thornton and Margaret is a familiar and intriguing one. I found myself rooting for them despite their difference of opinions and loved Mrs. Thornton's character very much. All in all, a great romantic classic, that hardly feels like a classic at all. I had never really considered reading any Elizabeth Gaskell novels until I watched, and greatly enjoyed, the BBC adaptation of North and South.I have to say, I love both the book and the miniseries equally! Mr Thornton has definitely acceded to the post of best literary hero in my mind (sorry, Mr Darcy!). I couldn't help but swoon over his thoughts. What a man!One of the things I really loved about this book was how real the characters were. They had their insecurities, weaknesses and petty jealousies, just lke ordinary people. Nothing was sugar-coated. I especially liked Margaret's independent and loyal character, though she did irk me in the beginning.I also enjoyed how Gaskell managed to contrast the north and south of England very well. She definitely did a great job of depicting the north as very gloomy. The commentary on social and religious issues was also fascinating to me.I'll definitely be buying myself a copy of this book! Norte e Sul é isso mesmo; um livro que nos mostra os contrastes entre o Norte e o Sul da Inglaterra vitoriana em meados do sé. XIX.Um norte industrializado a braços com as primeiras greves e reivindicações por parte de uma população laboral explorada, frente a um patronato que ia enriquecendo às custas da fome de homens e mulheres que viviam numa evidente pobreza. Do braço de ferro e dos consequentes confrontos surgiram as primeiras negociações entre patrões e empregados, naquele que iria ser um longo percurso até que ambos os lados percebessem que só teriam a ganhar se fossem criadas condições de trabalho onde prevalecesse o respeito mútuo e a cooperação.Vemos o Sul pelos olhos da família Hale; estes, de origem aristocrática, apesar de não terem muito dinheiro continuam a ter um estatuto privilegiado na sociedade, e mantém relações próximas e solidárias com a população mais desfavorecida.A mudança dos Hale para Milton, no Norte, vai dar origem ao desenrolar de uma narrativa demasiado extensa, demasiado previsível, onde os diálogos são escassos em confronto com reflexões e análises, a meu ver, demasiado cansativas.O desfecho adivinha-se no primeiro encontro dos protagonistas, e depois da autora arrastar a história durante 448 páginas precipita o final nas últimas 2 de forma incrivelmente abrupta.À maior parte das personagens faltou carisma – com excepção para a matriarca Thornton, deliciosamente malvada, e para o seu filho, John Thornton, talvez a personagem que nos é dada a conhecer mais intimamente. Margaret Hale, a protagonista, foi espevitada e coerente qb, mas não atingiu o píncaro esperado.Foi uma leitura morna a que faltou aquele elemento decisivo capaz de transformar um livro e de o elevar à condição de especial. I've been having conversations with my sister over the various articles being written on McDonald's unethical procedures of late. It's not the first time the topic has come up, but it is the first time since she was hired at said company's behest to earn her pocket money. I'll talk about employees cleaning their uniforms off the clock, she'll point out the ease of our home bound washing machine, I'll comment on the level of her paycheck, she'll speak of the guarantee of college, I'll bring up nightmares of corporation instigated welfare, she'll counter with the fact that the staff is 'nice'. A few bouts of this narrows it down to some variation of the phrase of "Yeah, it's bad, but it's not affecting me." And such.North and South touches upon this issue to a wonderful extent, workers and Unions and heads of manufacturing galore with a particular discussion between Margaret and Mr. Thornton(view spoiler)[, the former for social justice while the latter operated through an ableist paradigm, (hide spoiler)] earning four stars right off the bat. If you were wondering about the tone of that previous sentence, yes, it means that I had issues that required a great deal of balancing before I settled on the stars. When Gaskell's good, she's very very good, but the fact that this work was originally a serial shows in the blocks of authorial insight that don't quite meld perfectly together. Also, N&S was published in 1850's Britain, and it shows to a disappointingly seedy extent.What ties the aforementioned blocks together is main character Margaret Hale, and I am pleased to say that I was pleased with her. Barring all the enraptured talk about her eyes and hair and stoicism, this book is known as a romance, and when I read romances, what I'm interested in is the well-handled rejection scene that both displays the gal's brains and gives the guy his comeuppance if he's being a moaning twit about her lack of acceptance. Beyond that, her character was superbly crafted enough for me to forgive the cut-outish aspects of the others. I was particularly impressed with her (view spoiler)[after the death of her mother, when her father and brother were rendered utterly helpless, or "feminine", leaving her to handle all the practical necessities in the midst of her own far more subdued mourning. (hide spoiler)] The gender stereotypes were switched, and none of the characters suffered any loss of inherent structure for it. I love things like that.Now, the issues. The plot was going along well enough up until the worker's strike, but every subsequent dramatic event (view spoiler)[in the form of the death (hide spoiler)] afterwards was a seeming blow to the solar plexus of cohesive drive. I understand that Margaret wasn't going to be as active or engaging (view spoiler)[due to concurrent stretches of mourning (hide spoiler)] as in the beginning, but it got to the point that I have to wonder if Gaskell was conscientiously chopping off plot tendrils in the interest of time and lack of other reasonable conclusions. I'm not one for story, but when a particular device (view spoiler)[, aka death, (hide spoiler)] is repeated four times and hastier in its wrapping every repetition and all in all has nothing remarkably memorable to show for it, it gets stale.However. The plot I can forgive. The hate for the Irish I can't, what with the insinuations of "bloodline corruption" and weak-willed nonsense and lines such as"If the world stood still, it would retrograde and become corrupt, if that is not Irish.That's Margaret talking, and it's Margaret and her beloved father putting forth all of the previous without a hint of authorial condemnation that accompanies their servant's distrust of poor folk and other flavors of small character bigotry. Regarding the book, I truly "really liked it" as displayed in the hovering block, but lines such as the one above have ruined books for me, especially when so obviously of the author's own personal prejudice.On the one hand, real women and workers combining efforts with the company owners and all that jazz. On the other, discombobulation and bigotry. I'll let you be the judge. Have you read this book?If not, you should.I wish I could read it again for the first time.How he loves her will make an inescapable impression on you. If you are at all a romantic, this book is a must read. I just finished reading North and South. I had immediately preceded my read of Gaskell's North and South with a reading of Charlotte Bronte's Shirley; as they both tend to address the issues of life and love in the north of England and the interactions and differences between the gentry, the manufacturers, and the working class. Both novels involve quite serious romantic themes between gentlewomen and generally self-made Middle-class men struggling to forge prosperous businesses in the age of industrialization. Shirley is set somewhat earlier; near the end of the Napoleonic wars and the Luddite Riots; while North and South is probably set some 20 years later.In comparing the two novels, I believe that Ms. Gaskell has painted the more complete portrait of the class and social issues of life in an industrial town in northern England. I think it is fascinating that Gaskell chose to use the eyes of the young, well-educated, Miss Margaret Hale to illuminate, for the reader, the initial strangeness of the fabric and peoples of industrial Milton; a landscape as foreign to Miss Hale as it is to the reader. Margaret, her mother and father, and their house-keeper relocate from a quiet little rural village in southern England to the smoky and bustling northern town of Milton; a veritable beehive of factories, business and commerce, and extreme conditions endured by the workers and families that man the factories. As one reads the first quarter of the book it is almost as though the reader must shift their viewpoint from that of 'living' technicolor of the pastoral south to an almost noir-ish and starkly black and white of the industrial brick and mortar north. It is almost jarring and unsettling; but I quite imagine that it was a quite realistic portrait of the differences between these two disparate regions.Another important reason that I wanted to read North and South is that I have heard that this novel is also Austenesque; and not having read the novel until now, I simply took it as a truism. In my opinion, I think nothing could be further from the truth. Let me explain my thinking.First, the overall tone of the novel is darker, by far, than anything Austen wrote, including Mansfield Park. North and South is realistically bleak and mainly addresses social conditions across all walks of life in northern England. Austen rarely delves into the social and cultural conditions associated with people running businesses or working for a living. Austen tends to focus on the inter-personal relationships between her characters; and, to my knowledge, does not spend many words on the backstory of any of the servants, laborers, or farmers that briefly appear in her novels. The Mrs and Miss Bates (Emma) and Fanny Price's family in Portsmouth (Mansfield Park) is about as lower class as Austen goes in her novels. In comparison, in North and South Ms. Gaskell brings us, front-and-center, into the gritty and very difficult lives of the Higgins family and the orphaned Boucher children. Elizabeth Gaskell spends a lot of time in the novel describing the horrific working and living conditions of the working class in Milton, and it is not a pretty sight. Austen never does this.Second, politics is another relatively taboo subject for Austen in her novels; but not so for Gaskell. Elizabeth Gaskell weighs in with a gusto in describing the politics of the time that lead to, in her opinion, many of these gross social injustices that she is writing about. She is concerned about working conditions in the factory (Bessy Higgins and the 'fluff' disease), the use of child labor, the role of unions, strikes, and strike-breaking, etc. The closest that Austen comes to addressing anything political are some very subtle and oblique references to the abomination of slavery (Sir Thomas Bertram's properties in Antigua in Mansfield Park), and the occasional, also oblique, references to the inability of women to obtain an education and employment and inheritance issues. Austen never dwells, in any detail, on these social injustices or inequities though; while Gaskell takes 'em on, one after the other.Finally, Gaskell's portrayal of the growing romance and relationship between Mr John Thornton and Margaret Hale is handled completely differently than any romantic entanglement described by Jane Austen. Gaskell's portrayal can be sentimental, maybe a little maudlin, sometimes raw, abrasive, and almost uncomfortable at times as Mr. Thornton and Margaret interact day-by-day in Milton and come to know each other. Austen's relationships, even those doomed with 'bad' men, are orchestrated more like a graceful and elegant pas-de-deux. Style, grace, manners, and gentility mean everything to Austen. While gentility and manners are also clearly important to Gaskell (and Margaret and John Thornton! ), honesty and unrefined emotion are always apparent. Disgust and hurt are easily portrayed on Gaskell's character's faces, and sharp words can easily follow. In some respects, Gaskell's relationships of Margaret and Mr Lennox, and Margaret and Mr Thornton felt maybe more accurate and realistic; whilst Austen's feel more idealistic. One is not better than the other, they are just different approaches to describing the deep-felt emotions associated with courtship and establishing a romantic relationship between a woman and a man.In summation, the main observation I make in comparing North and South to the work of Austen is that Gaskell uses the relationship between Margaret and John Thornton to help guide the reader through an emotional and moral evaluation of the social and cultural issues that she is addressing in the novel. Austen, in contrast, uses her romantic relationships to address the natural and normal interpersonal communication issues of the people around her that she knew so much about. Austen's is a much more narrowly focused and personal novelistic point-of-view. 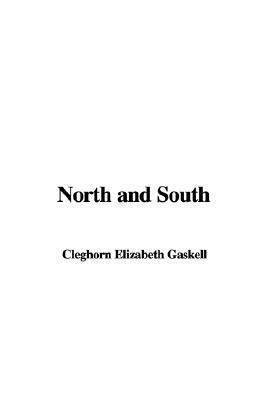 Gaskell's point-of-view is much more Dickensian, broad and panoramic.In closing, I enjoyed reading North and South! It was wonderful companion to Charlotte Bronte's Shirley, and it was loads of fun to think through my own comparisons of Gaskell's romances to those of Jane Austen's. In my opinion, this novel is well worth reading and is an important brick in the wall of literary Victoriana. Trigger warnings: loss of a parent, loss of a friend, suicide.24/3/2017I love this book an unnatural amount and I stand by everything I said last time around. I probably have more in-depth thoughts than that, but I'm falling asleep. So. 10/2/2015Elizabeth Gaskell is one of my favourite nineteenth century authors. I became mildly infatuated with Wives and Daughters when the BBC miniseries aired here in 1999, and became obsessed with it all over again in 2001 when I studied it at university (and let me tell you, I was not well pleased to turn the page and discover that Gaskell had rudely up and died before finishing the story! )My first exposure to North and South came courtesy of the 2004 BBC miniseries of fabulousness. I watched the first two episodes and absolutely adored it. So much so that I immediately went and bought it from the ABC Shop so that I could see the rest rather than waiting another fortnight, and I loved everything about it. That last episode is still one of my go to today-has-sucked-and-needs-to-be-fixed remedies. Because of reasons.I didn't read the book until about 2008, and the first time I read it, I wasn't sure how I felt about it. Bessie struck me as really whiny with her constant talk of death and religion. I found Margaret kind of annoying, Mr Thornton was sort of bland, and I really wasn't happy with the ending compared to the BBC series.But I've reread the book several times over the years, and I love it just a little bit more every time. Margaret is an incredibly interesting character, in that she's basically between two worlds. She's grown up with the upper classes in London, but that's not who she really is. At best, she was middle class. Her family never had huge amounts of money, and her father's parish was incredibly small. Yet she carries herself like nobility and looks down on anyone who works "in trade".What it takes for her to see her life as it really is are the opinions of the people of Milton. Gaskell's Northerners don't stand for Margaret's better-than-you attitude. While they're not actively disrespectful towards her, many of them treat her as an equal, something she would never have expected in London.Mrs Thornton, in particular, is super judgey towards Margaret and incredibly proud of her son and his achievements. She has no allusions about where their money comes from, and fails to see how Margaret and her tendency to romanticise life in the south is worth more than her son, who's built himself up from nothing to one of the most respected men in Milton.The change in Margaret's attitude becomes obvious when she returns to London and spends time with her cousin Edith, who's extremely privileged but seems to constantly pout and complain about her life and how hard it is. When living with Edith, Margaret - while she may not acknowledge that she used to be far more like that - sees the merits in the Northern way of life far more.In short, I love the characters, I love the setting, I love that the lower classes play just as much of a role as the middle to upper classes. But perhaps most of all, I love the ending - Gaskell's "delicious silence" is certainly one of the most explicit Victorian endings I've come across. I may still prefer the miniseries, but this is still one of my favourite classic books. Elizabeth Gaskell - Elizabeth Cleghorn Gaskell, née Stevenson (29 September 1810 – 12 November 1865), often referred to simply as Mrs. Gaskell, was an English novelist and short story writer during the Victorian era. She is perhaps best known for her biography of Charlotte Brontë. Her novels offer a detailed portrait of the lives of many strata of society, including the very poor, and as such are of interest to social historians as well as lovers of literature.